The power bank is delivered in a cardboard box with a window and some specifications on the back. It contains the power bank, a usb cable and a "instruction sheet". 1A and 2A usb output. On the other end of the box is a display. There is no doubt when the power bank is turned on. 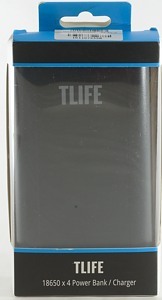 This is the power status display, when charging a mains cord is shown to the left and the bars in the batteries are animated. 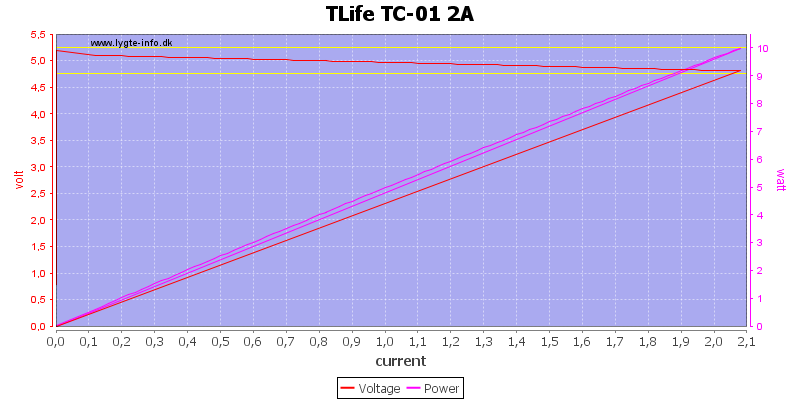 When current is drawn the display will show voltage and current for each slot. The display will not indicate charging. 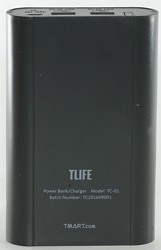 The box do not include any batteries, it is up to the user to supply from one to four batteries. 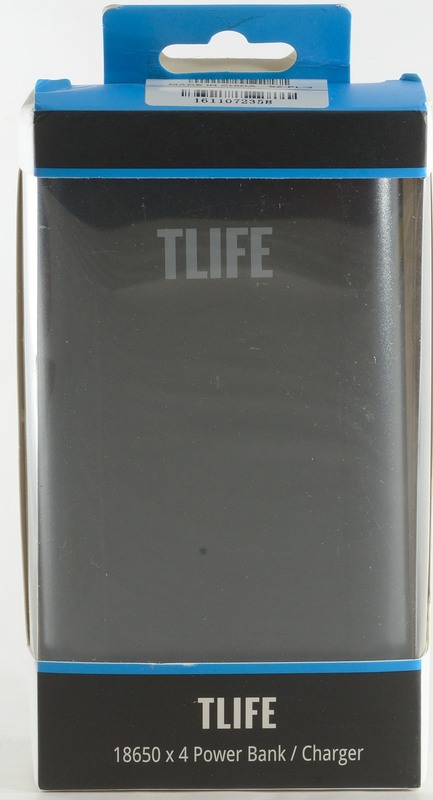 The length of the batteries can be from about 58mm to 69mm. 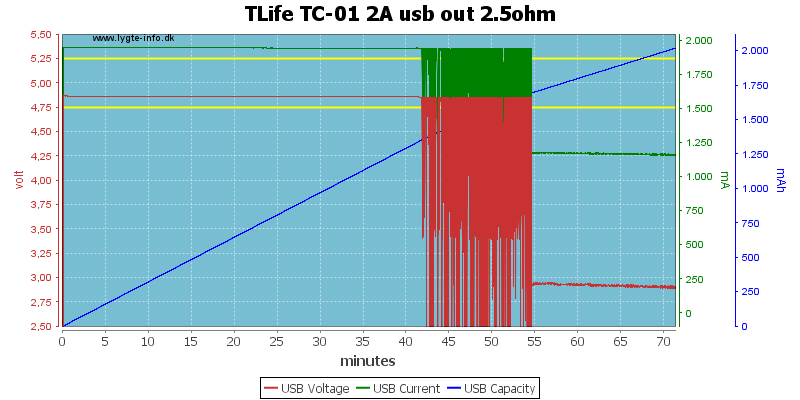 Limit for detecting current draw or not is about 30mA load on usb. The four battery slots are independent, i.e. no problem mixing full and empty batteries. 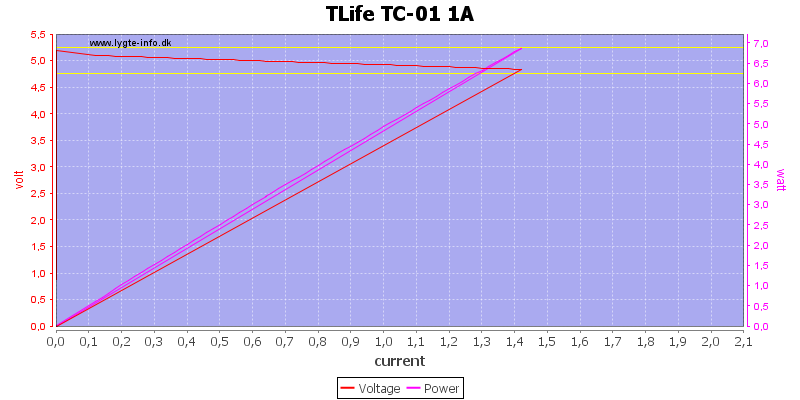 The 1A output will current limit at about 1.4A, this is good. The 2A limits just below 2.1A, it would have been nice if that had been 2.2A, due to the 2.1A coding. 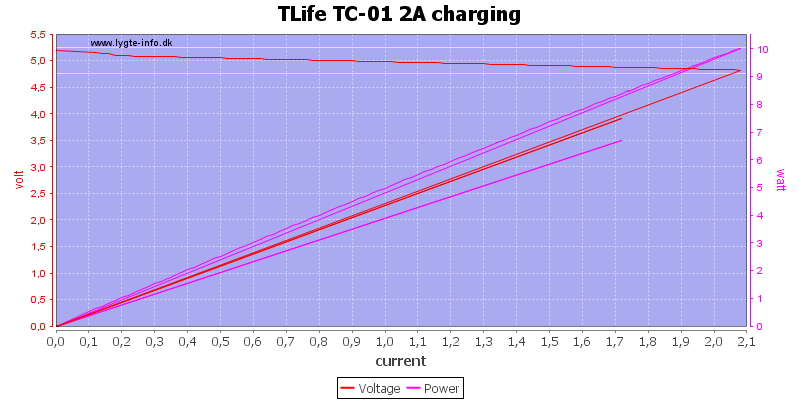 Using the output while charging is not a problem. There must be a battery in it for this to work. The meter is not very precise, but it gives a very good idea about the current draw. 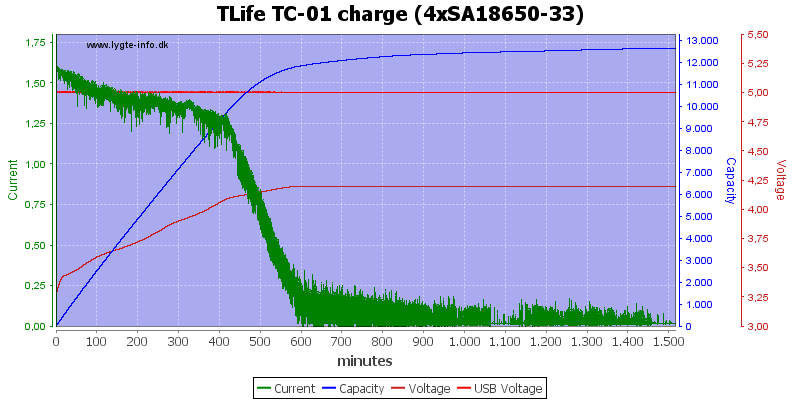 At 0.5A the output has no problem maintaining the output voltage until the battery is empty. 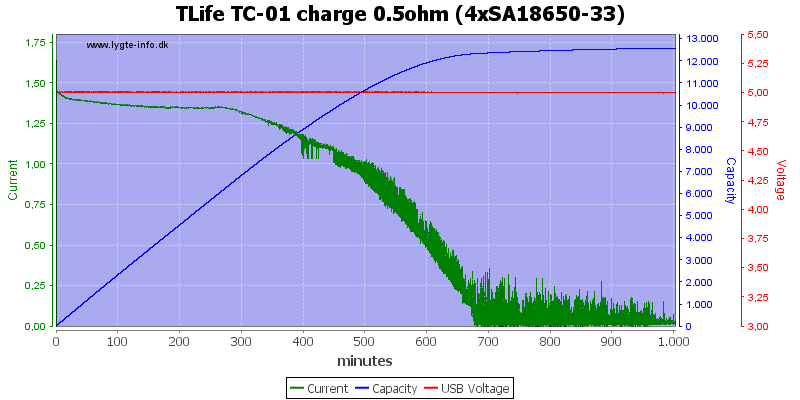 With 1A load the output voltage is lower, but stable. 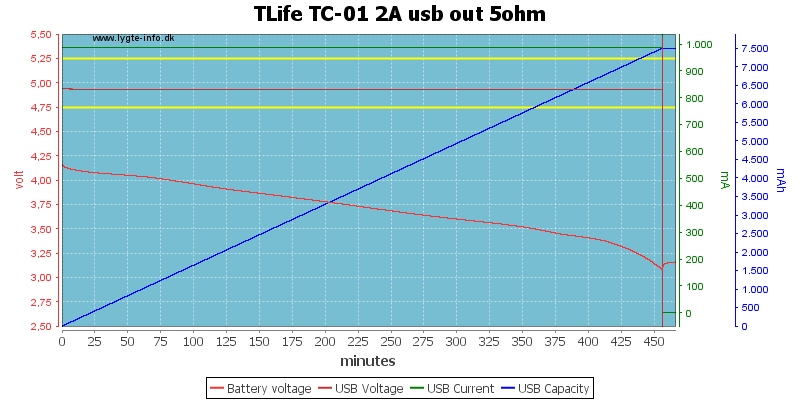 This time I monitor the battery voltage and as can be seen it stops when the battery is down to 3V. The box can deliver 2A for some time, but it got to hot and it died, this is not very good. The rated 1A input current is not correct, it will use up to 1.5A while charging and more if any of the outputs is drawing power. The charging looks good enough, but it takes 10 hours. 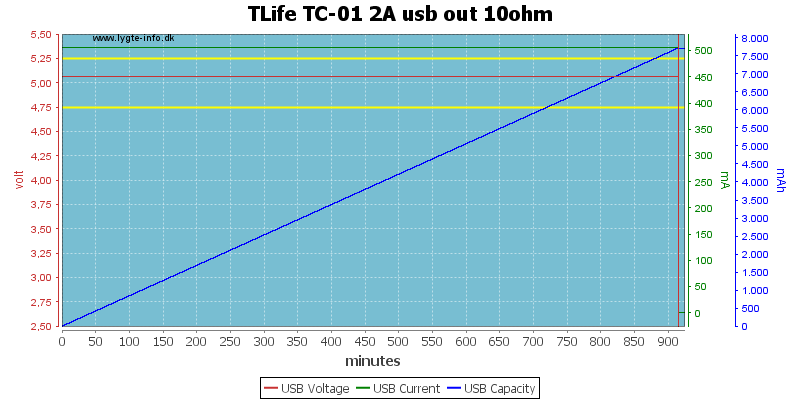 Simulating a long usb cable with a resistor will reduce the charger current, but not much. The time is about 12 hours. 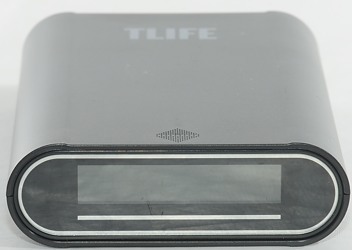 Long battery slot, i.e. can handle some protected batteries. Easy battery replacement, i.e. this makes it possible carry spare batteries or use it as 18650 charger. But some details could be better, the worst is that it died during my 2A discharge test, this is not good. The standby current is a bit on the high side, i.e. it cannot be stored for months with batteries in. I would also have prefered auto coding on the 2A port and a slightly bit more current. 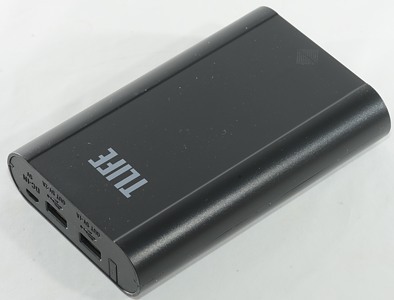 For most equipment it is a good power bank, but watch the current readout, if it is near 2A, there is a risk it will die, this also means my final rating is only acceptable. 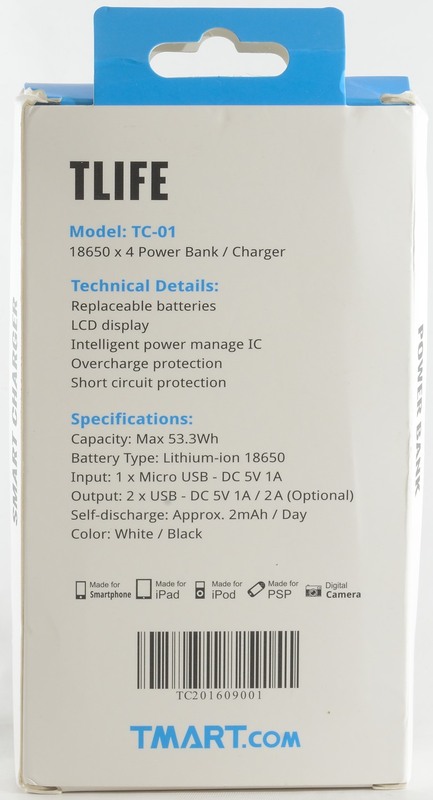 The power bank was supplied by Tmart for a review.